Yogyakarta is unique, distinctive and there are alsways different. One of the is Klitikan Market Yogyakarta, located on Jl.HOS Cokroaminoto 34, what’s interesting is that the market is sold various electronic and non electronic goods, both new and used, such as : household applicances, antique,Handphone, and its accesories,clothing, vehicle part, equipment builders,workshop equipment,musical equipment, shoes and sandals. 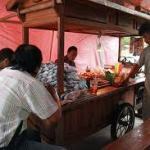 The market is more vibrant and bustling at night is supported by the famous food vendors add to the uniquenees of traditional beverages will Jogja tempo first period.